What's a humble working class fella supposed to do when he finds himself in a picturesque mountain town with a suitcase full of stolen cash? 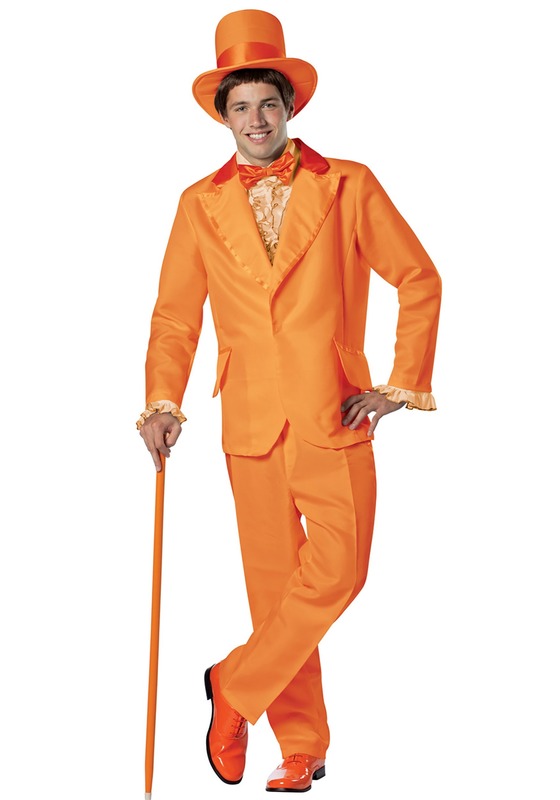 The same thing anyone else would do: blow it all on trendy outfits like this Orange Lloyd Costume, just like the snazzy tuxedo worn by Lloyd in the classic comedy Dumb and Dumber! Duh! Lloyd Christmas is a man of very particular tastes. He likes his cars dog-shaped, his clothes flashy, and his drinks in a Big Gulp cup, and he's willing to go to great lengths for what he wants. Of course, he always brings his best buddy Harry (who is arguably the brains of the bunch, which isn't saying much) along for the ride, and together, they get into some pretty crazy situations. Like finding out that the suitcase they've been hauling around was full of money all along, and deciding that it would be alright to spend a bit of it on basic essentials, like food and lodging. And a sports car. But hey it's okay, they'll pay it all back eventually.